I don't try to hide it, but I lovelovelove Paris. I have dreaming of us spending a leisure stay for a few days since the last time we went. Last time we hit all the major tourist attractions (Eiffel Tower, Notre Dame, Basilique du Sacre-Coeur, Louvre, etc) so we can just stroll through the 6e and have picnics in the Jardin du Luxembourg...since its across the street from our pension! I orginally dreamed of staying in a hotel so we could re-create the butter & ham sandwich we had last time. But with agency fees running about 30% its not cost effective and how can you say no to a place that is so affordable and just a mere .7 km from Pierre Hermes? Residence du Palais here we come! This is the fun part of planning, discovering new things and learning about a culture...and then soon experiencing it first hand. 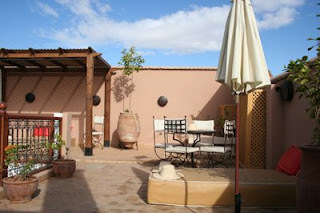 While I always knew that we would go to India (on my must list) I was not that familiar with Morocco. Don't get me wrong, I love tagine! But I didn't know much more about the country. I started trying to plan a crazy ferry ride to Fez a few months back but that didn't pan out. Marrakesh made the list of destinations, and I was so excited that I could use the Fodor's Morocco Guide I won on Wedding Bee. Marrakesh is what Fodor's calls the heartbeat of Morocco *swoon* After only reading a few pages I knew that we had to stay in a riad, which is like a large house with an interior garden, because they are goregous. I narrowed down a list of some I found and Riad 107 is sticking out to me, I am going to try to sway Charlton on it tonight, but with pictures like this how is he not going to love it? !